"The late Ikemba Nnewi, Dim Chukwuemeka Odumegwu Ojukwu, willed all his money to his wife, Mrs. Bianca Odinaka Olivia Odumegwu-Ojukwu, according to the bromide of his will exclusively obtained by Sunday Vanguard. 5. By my said will, in paragraph 12, I gave and bequeathed my interest in my mother’s property at Onwudiwe Street, Uwani, Enugu to my nephew Tom Bigger. 6. Also in my will, in paragraph 13, I gave my interest in my mother’s property at Thinker’s Corner, Enugu,Enugu State, to my nephew Robert Bigger. (a) Robert Bigger is my nephew, to whom I gave all my interest in my mother’s plot of land at Thinker Corner Enugu. That plot of land is registered as instrument No. 29 at page 29, in volume 478 of the land Registry, Enugu. 9. My wife, Bianca Odinaka Olivia Odumegwu Ojukwu shall retain my interest at No. 29 Queen’s Drive, Ikoyi, Lagos, which I fought hard to secure from the clutches of Lagos State Government. Ojukwu names mystery Hausa daughter in Will? THE Will of the late Ikemba Nnewi, Dim Chukwuemeka Odumegwu Ojukwu, was finally read on Friday at the Enugu High Court, with his widow, Bianca, getting the lion’s share. It was like a drama of sort as the Will, which was read by the Chief Registrar of Enugu State High Court, Mr. Dennis Ekoh, threw up some surprises as the late warlord identified an unknown Hausa woman, Tenny Harman, as number one among his children. There were to be more surprises as the name of Sylvester Ojukwu was omitted from the list endorsed by Ojukwu himself as his children. Emeka Ojukwu (Jnr) only got a property in Umudim Nnewi, Ojukwu’s hometown, as his entitlement. After appointing Bianca; the late Igwe of Oraukwu, Emeka Ojukwu and James Chukwuneme as trustees and executors of the Will, the names of the children was next; and the late Ikemba stated that only the eight listed, and no other person, should be regarded as his children. The eight children listed were Tenny Harman, Emeka Ojukwu, Mmegha, Okigbo, Ebele, Chineme, Afam and Nwachukwu. Bianca, who arrived the Enugu High Court premises in a black Toyota Prado Jeep at about 8:30a.m., could not hide her surprise when Tenny’s name was mentioned among Ojukwu’s children, as she started whispering with family members who were in the registrar’s office with her. The Nigerian Ambassador to Spain would be all smiles later as the Will awarded her Ojukwu’s Enugu mansion, ‘Casabianca’, located at No: 7 Forest Crescent, GRA, which was named after her. Bianca also got two properties located at plot 20 Jabi Abuja, with Certificate of Occupancy number 4405, as well as another property located at Kuje, Abuja. Ojukwu also said that Bianca should replace him as the trustee in the family company, Ojukwu Transport Limited, while he also willed to her two hectares of land at Umuezeani Umudim Nnewi. He, however, added that if she remarried, the land should be taken away from her. The late Igbo leader also willed to his wife all personal effects, money and cars for her upkeep and that of her children. Ojukwu’s strange daughter, Tenny, was allotted the Jubilee Hotels, Zaria; but when the codicil was read, it was observed that the hotel had been sold. Thus, she is to receive the proceeds from the sale. For the former commissioner in Anambra State, Emeka Ojukwu, it was not a fair deal as he got only a house in Umudim Nnewi. 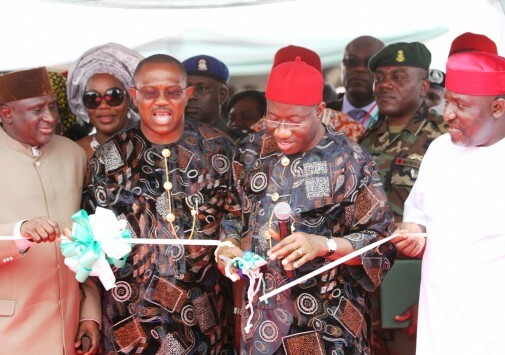 Onitsha (Anambra), Aug. 30, 2012 (NAN) President Goodluck Jonathan on Thursday commissioned the Chukwuemeka Odumegwu-Ojukwu Gateway in Onitsha as part of his one-day official visit to Anambra. Speaking on the occasion, Jonathan said the gateway stood as a symbol of unity in the South East and prayed that the cause for which the late warlord was known for would not die. GOV. 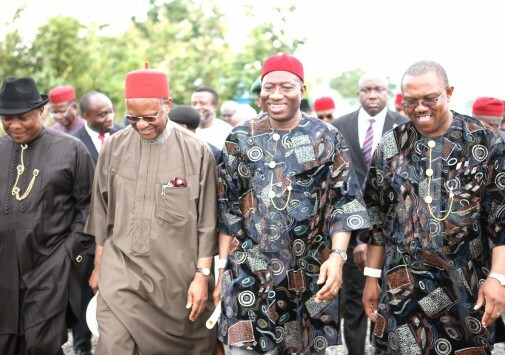 PETER OBI OF ANAMBRA STATE (L) WITH PRESIDENT GOODLUCK JONATHAN WATCHING ADAEZE DANCE GROUP AT THE AKANU IBIAM INTERNATIONAL AIRPORT IN ENUGU ON THURSDAY (30/8/12). He said the strategic site of the statue would always bring to mind the memories of the warlord and urged the people not to allow his dream to die. Speaking earlier, Gov. Peter Obi of Anambra said the gateway was the first point of contact with the South East, hence its choice for the immortalisation of Odumegwu-Ojukwu, and prayed that the statue would always touch the minds of the Igbo to think and act as one. Amb. Bianca Ojukwu, the widow of the late warlord, said she was delighted with the decision of the state government to honour her late husband in a special way. Also speaking, Gov. 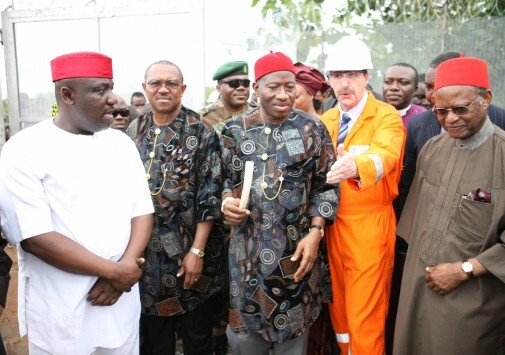 Rochas Okorocha of Imo said the gateway would surely bind the Igbo together on sighting the statue. In Nigeria and, indeed, many societies all over the world, it is not normal for bad things to be said about the dead. The simple reason which many lawyers also echo is that the dead is lifeless and can no longer be in a position to respond to the things said about him or her. This is the current fate of Ikemba Nnewi and Biafran hero Dim Odumegwu Ojukwu. In death, so many good things have been written and spoken about Ojukwu, a man the Nigerian nation loved to hate. We are today satisfied that Ojukwu and indeed pro-democracy martyrs have been vindicated following the events after his death. Therefore Ojukwu represents in our time, the brightest star that shines in the firmament once in many generations. National show of sympathy and events around Ojukwu’s burial show that majority of Nigerians and their elites are mere hypocrites and selfish. This is the singular reason why the nation is not growing despite the enormity of human and natural resources available at her disposal. The avalanche of bad eggs in the system has completely emasculated progressive voices. Backwardness in several areas of national development in Nigeria has reached a dangerous crescendo, forcing many to consider the option of a revolution as the only way out of this quagmire. If Nigeria had listened to Ojukwu while he was alive, if Nigeria had absorbed the message Ojukwu donated to this nation even as a young officer in the Nigeria Army; if our leaders, past and present, would be more patriotic and confront the issues of national development head on the way Ojukwu pursued his quest for a just society, our nation would be a paradise today. represent are the new national compass. While those who have contributed to bring shame to this country were shedding crocodile “tears” that Ojukwu was gone, the truth remains that inwardly, they are happy that like Gani Fawehinmi, this “troublesome man” is dead and gone forever. Ojukwu represents Biafra. Biafra, like June 12, represents an idea and no human force can wipe that idea away until Nigeria and Nigerians resort to the path of moral rectitude. If it does not come today, surely tomorrow is another day. Nigeria is a nation deeply rooted in injustice and inequity. Poor and lack of visionary leadership, corruption, poverty and disease have taken over the entire fabric of our nation and the centre can no longer hold. While other nations that were poorer or at par with Nigeria at some point even after Ojukwu had spoken and acted, are richer today. Meanwhile, our limping giant of Africa is still battling to define itself. If it is not Niger Delta militancy, it is Boko Haram or fuel subsidy removal and epileptic refineries, or National Assembly’s endless and spineless probes of one monumental fraud or the other, etc. At Ojukwu’s time were notable leaders like Chief Obafemi Awolowo, Dr Nnamdi Azikiwe and Alhaji Ahmadu Bello and their contemporaries who were older than him and called the shots in Nigeria. Our minds have been agitating as to what went wrong with visionary leadership at that time. How come these great minds and nationalists did not see what Ojukwu, at a relatively younger age saw? Even after that era, our leaders have failed to follow that path of glory till today. While Ojukwu was in exile, it was good for those who did not want him alive and they are numerous in all the geo-political zones of Nigeria. At a time, the fear of Ojukwu was the beginning of wisdom. When the government of Alhaji Shehu Shagari granted him pardon and Ojukwu returned from Ivory Coast where he was in exile, hatred trailed him. Ojukwu joined the National Party of Nigeria (NPN) instead of Zik’s Nigeria Peoples Party (NPP), a move many saw as betraying the cause of the Ibos. He explained that it was better to navigate the Ibos into the mainstream than be at the periphery of national politics. This was a time that the NPN had perfected strategies of rigging the 1983. Former Communications Minister Alhaji Ibrahim Tahir was detailed by the NPN to handle the elections in Anambra State where unfortunately Ojukwu was an NPN Senatorial candidate. The North did not hide their distaste for Ojukwu and his presence in the senate would have been a threat to Shagari and the Northern interest. It was for that reason that after the NPN had swept the other elections in the South East using a sophisticated machine, Tahir cleverly withdrew his machine a few days to the senatorial election and in anger, the Ibos voted for the NPP candidate and Ojukwu again failed. At that time the same NPN rigging machine also enthroned Chief C.C. Onoh as the new governor of Anambra State as incumbent Governor Jim Nwobodo was rigged out. It was the same commando style of election rigging as well as the colossal mismanagement of the national economy that paved the way for the overthrow of the Shagari administration by Major General Mohammadu Buhari and Major General Tunde Idiagbon on December 31, 1983. So the point here really is that many of those who are speaking in glowing terms about the ideals of Ojukwu are merely being hypocritical. They hated Ojukwu and his ideals. His message was an anathema to them. Unfortunately, no matter how many years it takes, Nigeria must address the issues that Ojukwu’s life and time represented to us. Questions relating to how Nigerians will live happily together in a progressive nation where equality will be respected and no one will be oppressed must be addressed. There is no other option to point the way forward. My friend Ignatius Chukwu is a journalist of Ibo extraction with a national character. He is one of those we classify as truly Nigerian. Recently he examined Ojukwu’s death as it affects the South East and South-South coalition and the abandoned property issue. We find it relevant here. He said in part: “Today, the face of Ikemba Nnewi adorns two strategic places he could hardly have been free to touch while alive, the Brick House and Isaac Boro Park. Many believe that most of the south-southerners and south-easterners can hardly go to the larger Nigeria in one voice. The politics of the South-south seems to be shaped by a fierce opposition to what the Southeast stands for. The mantra in the South-south is that the Southeast maltreated them and so must be rejected and resisted. This message seems to pass from father to son. The contrast in the two zones came to a head in the civil war period when Enugu fought for Biafra but Port Harcourt stood for Nigeria. Ojukwu’s desire to fight for one region, one destiny, and one voice in Nigeria was therefore punctuated. The Igbo man views Nigeria as a symbol of oppression, Port Harcourt political club views the Igbo as symbol of oppression. This perception seems to rule the inter-zonal relationship. Isaac Boro himself confessed in his autobiography that he launched his 12 days revolution because an Igbo man (Johnson Aguiyi-Ironsi) became Nigeria’s head of state, and probably because Ojukwu became Military governor of the east. When a northerner took over from Aguiyi-Ironsi, Boro said he dropped his agitation and rather joined the federal effort to keep Nigeria one, a cause he died for. Ojukwu never got Boro’s endorsement while both lived. Ken Saro-Wiwa, a Niger Delta hero and icon, never spared a pint of love for Ojukwu and whatever he stood for. Ojukwu was to tell reporters in Port Harcourt about seven years ago during his reception that it was Wiwa that always attacked him literally, and never did he (Ojukwu) once attack Wiwa. And when Ojukwu died and the nation, both friend and foe, rose in unison of salute to a misunderstood hero, the only voice that still insulted the Ikemba came from Wiwa’s enclave, one Ben Ikari, who also insulted President Goodluck Jonathan for condoling the Ojukwu family. The most striking achievement Ojukwu recorded at death is ability to sit atop the Garden City and at the gate of the seat of power in Port Harcourt, the Brick House, from where he must be peeping at his father’s houses. Those who think they know everything say part of the Brick House was Louis Ojukwu’s house, some point at a building at Education Bus Stop as one belonging to him too, but these are all classified as ‘abandoned property’. So, if Ojukwu could not enter into them while alive, his pictures at least got close to them at death. When he was alive, Ojukwu was regarded as a secessionist-coupist and blood-thirsty aristocrat but now at death, many said he hated the idea of divided Nigeria or using bloodshed to solve the Nigerian problem and so had to handle Kano without bloodshed during the January 1966 coup. This. And social engineers are saying these must be the foundation for a new Nigeria, or nothing. Dim Chukwuemeka Odumegwu Ojukwu meant different thing to different people. To the authorities of Kings College then, he could have been a stubborn student. But the venom which gave young Ojukwu the push to beat up a white tutor for molesting a black female staff, was not stubbornness but abhorrence for injustice and unquenchable desire to fight for the less-privileged. Ojukwu was a human rights activist who could not describe himself. To his influential father, Emeka Odumegwu Ojukwu could have passed as a disobedient child for refusing the course his father chose for him and opting for another. But Ojukwu may just have shown leadership in the pursuit of independence of mind, clear vision and sense of responsibility. After all, the right to say no, it is said, is the first condition of freedom. A freedom that carries responsibility for the consequences. Ojukwu’s father, wherever he is today, must be proud of his son. Just as, coincidentally, the Chairman of Ojukwu’s burial committee, Rtd. Justice Chukwudifu Oputa, is, today, proud of his son, Charlie Boy, who also disobeyed him in the choice of career. To the Nigerian military, Ojukwu was a surprise entrant, being the most educated recruit into the military at that time. But Ojukwu’s mind was focused. He wanted to imbibe the discipline that the military offered and stood for and to make a success of it, without allowing the more mouth-watering opportunities his big certificate could offer him to distract him. Ojukwu fought against indiscipline in the military when he insisted on the right person, Brig. Samuel Ogundipe, the most senior military officer then, succeeding the late Gen Aguiyi Ironsi. The person Ojukwu insisted on was not an Igbo. He was a Yoruba. Ojukwu wanted to maintain esprit de corps in the military which was supposed to stand as an example of a disciplined force. Ojukwu was overruled without a convincing reason, and he refused to take orders from one he conceived as not being the next in command, Gen Gowon. The ghost of that indiscipline in the military which was allowed to stand, is still haunting Nigeria as a nation today. It laid the foundation for the culture of impunity and the rule by cabals. Who were those cabals? Are they still very much around today, or are we battling with their long shadows? Before President Jonathan contested the last election, some prominent Nigerians, most of them already adults at the break of the civil war, threatened to make Nigeria ungovernable if Jonathan dared declare his interest or goes on to win the election. They wanted him to be disciplined and stay on line. How soon can we forget? Well, could that truly be why there are explosions everywhere? Ojukwu showed what good leadership and accountable government are all about. After the fall of the First Republic, Ojukwu was appointed the Administrator of the Eastern Region. In all the constitutions of advanced countries, the primary duty of government is the protection of lives and properties of its citizens. When it became obvious to Ojukwu that the protection of lives and properties of people from Eastern Region was no longer guaranteed in Nigeria under the watch of the Federal Government, he weighed the options he had – gather his people together and show leadership, or abandon ship and seek personal safety. He exhibited courage and chose the former. He gathered the survivors of his people and declared a state of Biafra, which was the only way he could go if he had to save the lives of his people, who were no longer secure in Nigeria. He never declared war against Nigeria. Ojukwu, like Moses, only asked to let his people go. But Nigeria, like Pharaoh, said no. Ojukwu wanted to be a true Nigerian, but he was forced into a secessionist. He wanted to be a true leader, but he was forced into a warlord. Notable dramatis personae of the period are still very much with us – the persons of Generals Yakubu Gowon, Danjuma, Obasanjo, etc. And what is more, many of them profess the Christian faith. Which brings me to the Bible and the issue of Nigeria Prays, a pet project of Gen Gowon. To this writer, Gen Gowon epitomises the quintessential of courage garnished with humility. Humility, according to Roberts Dilts and Judith DeLozier, “involves knowing your limits and having appreciation for the intentions, strengths and perspectives of others”. Gowon had the courage to prosecute the civil war. At the end of it, and with his appreciation of the cause, coupled with his experience on the field, he knew the war was over and won, but not the battle. The battle is not over because the sins that led to the civil war are still with us. These are sins of impunity, indiscipline, injustice and bad governance. These are the sins Ojukwu fought against and died fighting. He never gave up and the battle is on. It just needs a new arrowhead. Gowon, nevertheless, had the wisdom to proclaim “no victor, no vanquished” and to launch his post-war three-pronged programme of the famous 3Rs – reconstruction, rehabilitation and reconciliation. Embedded in humility, of course, is the recognition of a higher force. So it is not surprising that out of power and with the addition of a doctorate degree to his cerebral prowess, it was time for him to launch his innate quality of humility. That, to me, came out as a finished product in Nigeria Prays. The efficacy of prayers, for believers, is not in doubt. But no one can mock God. The Bible prescribes procedure. In sum, it says that if people can humble themselves, confess their sins and pray, God, in turn, will hear their prayers and heal their land. Right now, Nigeria prays. But has Nigeria first confessed her sins? This writer doesn’t think so. Which, perhaps, is why the more Nigeria prays, the more Nigeria boils. Though some positivists can argue that it could have been worse. In the continued but obviously reluctant implementation of Gowon’s 3Rs post-war programmes, an offshoot of his “no victor, no vanquished” stand, a lot of rehabilitation and reconstruction have been done. Today, rising from the ashes of the civil war and the imposition of the limit of twenty pounds on ex-Biafrans – irrespective of the value of Biafran currency possessed at the end of the war – Biafrans, and Igbos in particular, have moved on and gradually played themselves back into the mainstream of Nigerian socio-economic and political life. 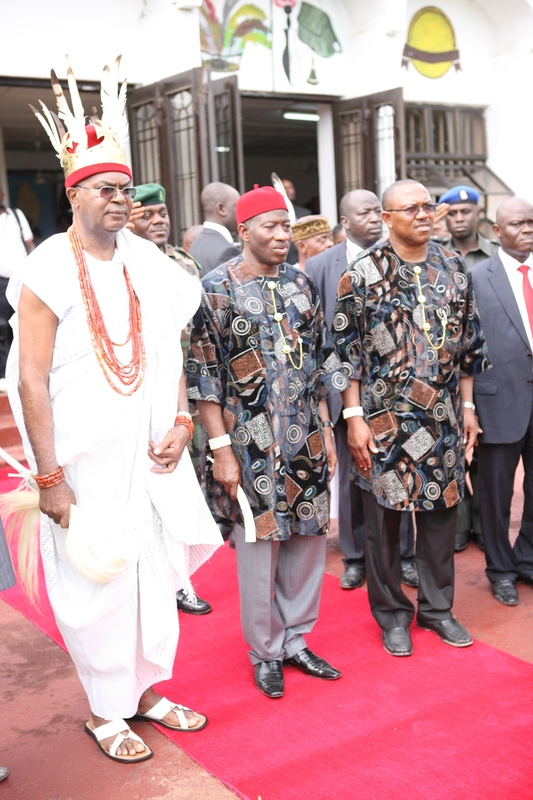 Of recent, Igbos have been IG, Senate President, Chief of Army Staff, etc. Today, an ex-Biafran is the President of Nigeria. I understand that some ex-Biafran fighters who were enlisted in the Nigerian military before the civil war were recently recalled and retired with benefits. So, yes, in the area of rehabilitation and reconstruction, post-war Nigeria has moved on. But same cannot be said in the area of reconciliation. In a capitalist economy, like Nigeria, the most prominent signpost of wealth and power is land. It is argued that the Gowon’s regime created the 12 states out of the then existing four regions to principally break the rank and bond of Biafra, by taking a larger chunk of the oil-bearing lands out of Ojukwu”s control. Gowon had every right as a soldier to employ any strategy that could help him win the war, provided such does not amount to war crime. So Gowon, one could argue, prosecuted the war as fair as he could – with the exception of being accused in some quarters of using starvation as a weapon of warfare based on advice by some rehabilitated opportunists – won it, and exhibited his humility by the pronouncements he made and the programmes he instituted and tried to implement. An Act to make provisions for the sale, registration and maintenance of abandoned properties by the Implementation Committee set up for the purpose. 1. (1) Every sale or disposition of abandoned properties conducted by the Abandoned Properties Implementation Committee (hereinafter in this Act referred to as “the Committee”) set up by the Federal Government shall be deemed to have been lawful and properly made and any instrument issued by the Committee which purports to convey any estate or interest in land, shall be deemed to have been validly issued and shall have effect according to its tenor or intendment. (2) Any abandoned property sold pursuant to subsection (1) of this section shall vest in the purchaser free of all encumbrances without any further assurance apart from this Act. (3) The Registrar or any other person in charge of registration of land, instruments, deeds or rights affecting land shall, upon presentation to him of any contract of agreement signed by or on behalf of the Committee, expunge from the relevant register the name of any person in whose name any interest is registered in respect of any property affected by this Act and substitute therefore the name of the new owner. 2. Any person who contravenes or fails to comply with any of the provisions of section 1 of this Act shall be guilty of an offence and shall be liable on conviction to imprisonment for one year without the option of a fine. 3. (1) Any member of the Committee or any person acting on its behalf shall stand indemnified and no suit or other proceedings shall lie at the instance of any person aggrieved in respect of any property sold by the Committee or anything done in compliance with the direction of the Federal Government in respect of abandoned properties. (2) The question whether any provision of Chapter IV of the Constitution of the Federal Republic of Nigeria has been, is being or would be contravened by anything done or purported to be done by the Committee shall not be inquired into in any court of law, and, accordingly, sections 40, 42 and 220(1)(b) of the Constitution shall not apply in relation to any such question. (3) Any proceedings against the Committee or members of the Committee or any person acting on its behalf (whether criminal or civil) commenced before the date of commencement of this Act shall cease and any order or ruling already made shall be null and void and of no consequence whatever. 4. This Act may be cited as the Abandoned Properties Act. •President Jonathan, his wife, Patience, and Chukwuemeka Ojukwu Jnr, paying their last respect to Chukwuemeka Odumegwu Ojukwu at Nnewi. 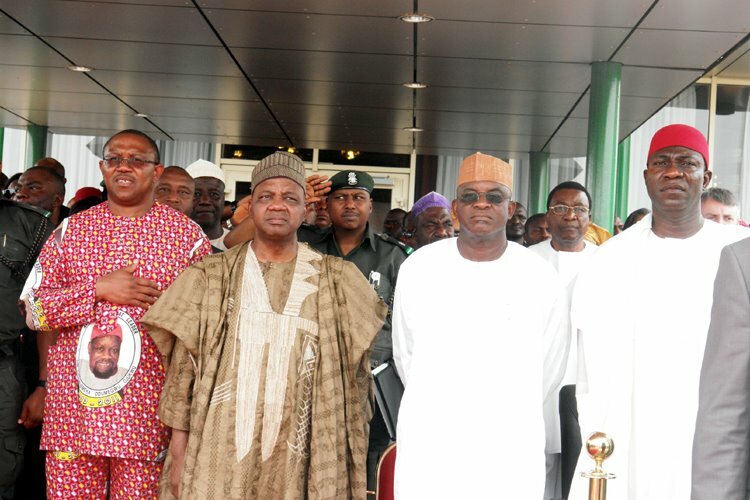 From right, Enugu State governor, Mr Sullivan Chime; Vice-President Namadi Sambo; Deputy Senate President, Senator Ike Ekweremadu; former Ghanaian head of state, Flight-Lieutenant Jerry Rawlings and the Deputy Speaker, House of Representatives, Honourable Emeka Ihedioha, during a national inter-denominational funeral programme for former Biafran warlord, Chief Chukwuemeka Odumegwu-Ojukwu, at the Michael Okpara Square, Enugu, on Thursday. On the front row are members of Chief Ojukwu’s family. The late leader of Nigeria's breakaway Republic of Biafra received final honors Friday from a nation he once fought bitterly against in a war that saw 1 million people killed. Mourners gathered Friday in Nnewi, a city in Nigeria's eastern Anambra state, for the funeral and burial of Dim Chukwuemeka Ojukwu, who led Biafra during the three-year civil war. His body lay inside a closed gold coffin draped in the Nigerian flag with an officer's black dress shoes, cap and sword laying atop it. Soldiers stood guard by a man who once rejected the idea of a united Nigeria, a multiethnic nation now home to more than 160 million people. Okeke Ngozika Theophilus, a 77-year-old poet who remembered Ojukwu from childhood, said he came to give his last respects. "Like every other hero, including the kings of England, they were buried. I have come to accord him a bye-bye," he said "On my own in 18 months I will be as old as him. I am watching how I will be buried myself." Ojukwu died in a London hospital on Nov. 26 after a protracted illness following a stroke. He was 78. His funeral, already once delayed, has seen a revisioning — or at least a remembrance — of Nigeria's bloody civil war in a country where an almost collective amnesia about the event still exists. President Goodluck Jonathan has repeatedly mentioned Ojukwu and his legacy, something previous unheard of. Ojukwu's coffin also has been transported around the country under a military honor guard. For his family, that honor means a lot after seeing much of the family's wealth confiscated at the end of the civil war and Ojukwu living in exile for more than a decade. "He was a passionate man who wanted very much to leave his footprints in the history of his country," his brother Lotanna Ojukwu said. The roots of Biafra came from a 1966 coup in Nigeria, a former British colony that had gained independence only six years earlier. The coup, led primarily by army officers from the Igbo ethnic group from Nigeria's southeast, saw soldiers shoot and kill Prime Minister Abubakar Tafawa Balewa, a northerner, as well as the premier of northern Nigeria, Ahmadu Bello. The coup failed, but the country still fell under military control. Northerners, angry about the death of its leaders, attacked Igbos living there. As many as 10,000 people died in resulting riots. Many Igbos fled back to Nigeria's southeast, their traditional home. Ojukwu, then 33, served as the military governor for the southeast. The son of a knighted millionaire, Ojukwu studied history at Oxford and attended a military officer school in Britain. In 1967, he declared the largely Igbo region — including part of the oil-rich Niger Delta — as the Republic of Biafra. The new republic used the name of the Atlantic Ocean bay to its south, its flag a rising sun set against a black, green and red background. The announcement sparked 31 months of fierce fighting between the breakaway republic and Nigeria. Under Gen. Yakubu "Jack" Gowon, Nigeria adopted the slogan "to keep Nigeria one is a task that must be done" and moved to reclaim a region vital to the country's finances. Despite several pushes by Biafran troops, Nigerian forces slowly strangled Biafra into submission. Caught in the middle were Igbo refugees increasingly pushed back as the front lines fell. The region, long reliant on other regions of Nigeria for food, saw massive food shortages despite international aid. The enduring images, seen on television and in photographs, show starving Biafran children with distended stomachs and stick-like arms. Many died as hunger became a weapon wielded by both sides. Nigeria's Igbo people have since been largely marginalized in the country's politics, despite being one of the nation's top ethnic groups. Many hope for that to change in the upcoming 2015 presidential election, as there's been discussion about the nation's ruling party picking an Igbo as its candidate. One of the best things about the passing of Chief Chukwuemeka Odumegwu-Ojukwu is the kind of tributes which the news of his passing has elicited across the country. The former leader of Biafra has enjoyed the distinction of being eulogised across the political, ethnic and religious spectrum. From every part of Nigeria, Nigerians, high and low, prominent and ordinary, old and young have stepped forward to honour him with moving tributes. For a man whose life was defined by the role he played in the turbulent three years of the Nigerian Civil War, a man for whom the prefix “rebel” was once de rigeur, this was quite an achievement. The praise is also very well deserved because the life of Ojukwu exemplifies what can happen when principled courage meets patriotism. Here was a man who went to war out of conviction but who also, out of conviction, decided to stop fighting and come home to contribute to achieving the purposes for which he went to war, this time through civil and democratic means. The Eze Igbo Gburugburu was indeed a rare man who without giving up his principles, made peace with his enemies and joined hands with other patriots to seek solutions to the challenges of nationhood. For me, and I am sure many other Nigerians of my generation on the Biafran side who are old enough to remember the cataclysmic events of the Civil War which largely defined our youth, the wave of tributes triggered by Chief Ojukwu’s passing has evoked a sense that things have come full circle. Many young Nigerians do not know that the Nigerian Civil War was one of the most tragic landmarks of the 20th century, a conflict whose horrendous human suffering inspired the founding of one of the most important humanitarian organisations in the world, Medecins san Frontierres (Doctors without Frontiers). In all, an estimated one million persons perished in the war; some estimates cite double that figure. The response to Ojukwu’s passing has, simultaneously, recalled the nightmare years of war and also acted as a balm of healing for those deep pains of yesterday. The memories are many. I remember helping my mother and a collective of other women in Port Harcourt cook for Biafran soldiers, making “dry packs” of preserved foods to feed soldiers at the war front. I remember my father, a Brigadier in the Biafran Army and head of the Biafran Organisation of Freedom Fighters (BOFF) in his uniform. I remember young men relatives, friends, and neighbours – who waved goodbye as they went off to war – and never came back. It is against this background that one can best appreciate the balm the overwhelmingly positive reaction to Ojukwu’s death. The man whose name some saw as a symbol of division has, in death, done so much to unite Nigerians. That is the spirit that I want us to celebrate and share with our children. It is the positive spirit of renascent Nigeria, a spirit that acknowledges the problems and the pain, yet refuses to give up on the shining possibilities of a brighter future. It is the spirit that refuses to be defined by glib negatives, a spirit that insists on doing the difficult but necessary work of building a strong foundation for a better future, even as we learn from the mistakes of the past. It is this kind of spirit that inspires hope for Nigeria. It is the spirit of Dim Chukwuemeka Odumegwu-Ojukwu. Thank you, Ikemba, Eze Igbo Gburugburu, thank you for sharing your strong but resilient spirit with us. Thank you for teaching us how to fight and how to make peace while standing strong. Thank you, Bianca for being there till the end, thank you Odumegwu-Ojukwu family for your great gift to Nigeria. And thank you Nigeria for celebrating and honouring our remarkable brother and son. Dr. Ngozi Okonjo-Iweala is the present Nigerian minister of finance and co-ordinator of the President's Jonathan economic team.